I know it’s late in the day, but I just learned that for today only, the Bill & Melinda Gates Foundation will match donations made to my classroom project on DonorsChoose.org. Before tonight (midnight West Coast time, if we’re being specific), you can make a donation of any size to my project, Create Lifelong Readers With Vibrant New Graphic Novels… and if you enter the code JUMPSTART at checkout. ol’ Billy Microsoft will double your donation up to $1,000 per donor – every bit helps! I could write a couple of paragraphs about how bad they old ice cube trays were and how good the new ice cube trays are but I guess I’ll let this terrific comic stand on its own. As impossible as it seems, it’s nearly time to go back to the classroom for another school year! This new year will be an interesting one for me in that I’m starting a new job at a new school. I’m running the gamut of emotions about this change and hopeful my work in this new job will translate into some good comics over the next few months. 1. I have an Amazon Wish List for my classroom. I try to curate a list of interesting, eye-catching books for my students as well as supplies I know they will need to succeed. I am in dire need of Post-It Notes for the upcoming semester. 3. You can buy stuff from my Etsy store! I have a variety of comic sketch covers available as well as a ‘zine bundle of the last year’s worth of teaching comics. I’m starting to hear from folks who very much enjoyed their bundles. Finally, you can like, share, comment on and reblog my comics to heighten awareness of my work as a teacher. As always, I thank readers out there for supporting me, the comic, and my classroom. New comics will (hopefully) begin in September but until then, please consider some of the links above. Thanks so much! 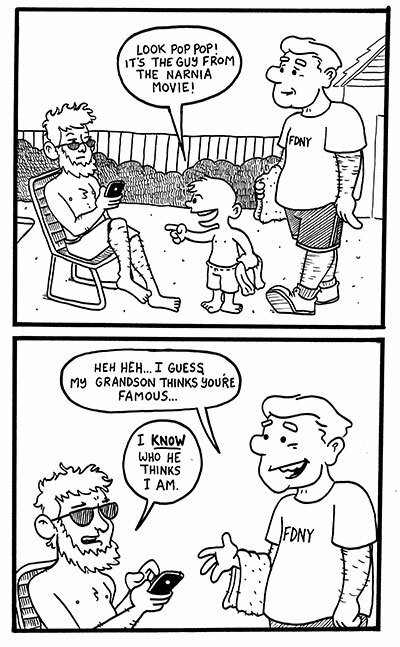 I can’t tell if it ruins the comic to TELL you who the lifeguard looked like. You are currently browsing the Teachable Moments blog archives for August, 2015.